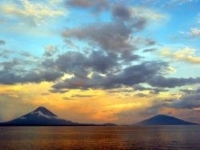 The twin volcanoes on Lake Nicaragua are highlights for visitors to the scenic country. They are situated midway between Nicaragua and Costa Rica. Visitors to the islands explore volcanoes by hiking through rainforests, while one can also pay a trip to a local coffee farm which is dependent on the fertile slopes to grow fragrant beans. Birds and wildlife delight nature lovers, while sports enthusiasts enjoy kayaking and fishing tours around the island. For those who brave hiking the 3,300 foot (1,500m) summit of one of the volcanoes, the views are unsurpassed. Visitors could easily spend a few days exploring the numerous natural attractions the islands have to offer. Boats from San Jorge, just outside Rivas, to the islands cost around NIO 50. Ferries also depart from San Carlos and Granada, costing between NIO 50 and NIO 70. They don't leave every day and are sometimes inactive due to low water levels. Ferry rides take 6 to 12 hours, depending on the point of departure, and are perfect to take in lake scenery.